Every child is unique and is blessed with different qualities. Some children are friendlier, social and confident. They feel at ease even in the presence of complete strangers whereas there are others who would often keep to themselves and feel happier when they are at home doing the activities they like. Everyone is born with different personality traits. It’s the way they are and the way they feel comfortable. The extroverts tend to gain more acceptance and popularity with their social skills and that is much more appreciated. On the other hand, the introverts take a long time to open up and find it difficult to exhibit their calibre and talents which tends to remain hidden inside them. Being an introvert myself, I know how difficult it is to make friends and reach out to people. How uncomfortable and alienated I used to feel in the company of people. Even now I don’t have anybody to call as a friend but that is the way I am and that is the way how I feel happy. It’s about being comfortable in one’s own skin. In the absence of likeminded people, sometimes one finds a great company within oneself. My two daughters are poles apart. The elder one is my rock star who happily greets everyone she meets in her way. Quite opposite to her is my little songbird, who sings her own songs happily at home. My rock star loves going outdoors whereas my song bird prefers staying indoors. I love both of them for they have their own luminosity. There were times when, my little one would cry endlessly whenever we had to go out of the house even for an outing specifically for the kids. She would prefer playing alone in the park and avoid company. It started bothering me when it was time for her to get admission in school. I took her to the day care of the play school I was planning for her. I took her there for two hours initially and stayed in the school. I helped her to get familiar with the school environment and the staff there. During the summer holidays, I enrolled both my girls in the summer camp of the same play school. My little one started feeling more confident and secured in the company of her sister. After holidays, when I enrolled her in the play group of that school, she was completely comfortable and well adjusted. Gradually, with a lot of love and encouragement, she has become confident and open to people. Although, she feels happier at home but she has opened up and started making friends on her own. Now, when we take her to a new place, she takes some time initially but gradually becomes friendly. This positive change in her makes pen down a few points which helped me in opening up and now helping my little song bird. An introvert child will never ask for your company but it is not that they don’t want it either. They might be too shy to come to you. Be with them. Spend time with them in doing the activities of their choice. It helps them feel more confident and connected. It will help the child in getting his personal space at the same time he will bond with you. An introvert child will become more introvert and lose confidence if the elders make fun of him in public or start labelling him as “rude”, “shy guy”, “arrogant” or “introvert”. Appreciate them for being the way they are. He might be more talented than what you think. His being shy does not make him weak rather he has more strength to stand alone. Give the child time to get to know and familiarise with new people and new situations. They just need a little more time than others in adapting to new situations. Help them in feeling comfortable to new surroundings and new people. It’s alright if they do not like to be kissed or hugged. Give them other options of greeting their elders. Help them familiarise in new surroundings by offering or showing them some familiar things. Let the child feel that you love him and is proud of him for the way he is. You are with him, even if he doesn’t want to be among the strangers. Your constant love and support will help introvert children in coming out of their shells. Let them feel that you are all ears for them whenever they wish to express themselves. Criticism and judgement is what they are afraid of and makes them shy away. Appreciation and positive encouragement is what they long for. Appreciate and encourage them even for their smallest achievement. Even if the child tried to speak a few words in the school function, he needs a big applause. For he had put a lot of effort to be on the stage and face the audience. This support and understanding from my parents helped me a lot in becoming more confident and connecting with people. With the same love, support and encouragement, we have noticed a big difference in my little shy bird. She is becoming more confident, talkative and outgoing. Do share with me your views and tips too to help an introvert child become friendlier. 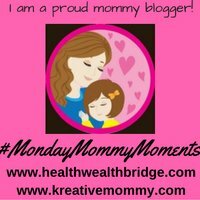 This post is a part of the blog chain #MMM or #MondayMommyMoments. This post is in link up with my fellow bloggers Deeepa and Amrita. Nice. Very effective pointers. I liked where you said being shy means he has more strength to stand alone. That’s a very positive way of looking. Yes every child is unique some speak more some less. They have their own nature. I loved reading it I must say we should never push them to change. This is an awesome post Vidhi. The points you mentioned can really bring changes for a shy child. I have lived the life of an introvert before and I know how useful these points are. I know what you mean. My daughters are poles apart & they have their own individual personalities too. I never bother because everyone has their own personality. I’m experiencing the exact thing with my two kids. Lovely read. We should focus on their individual talents. My both children are also poles apart. My elder daughter is very friendly and my younger son is a little high headed when it comes to talking to strangers. I totally agree with you that we should never embarrass a child in public.